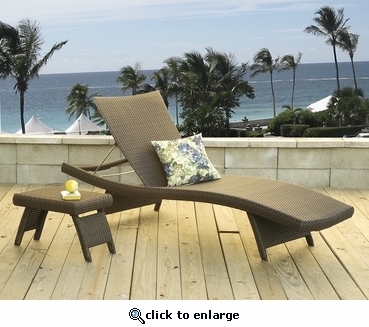 This contoured chaise allows for perfect positioning by adjusting both legs and backrest. The featherlight assembly makes repositioning effortless. The textured flat "All Weather" vinyl/resin fibers are handwoven to resemble the finest peel rattan. The tubular aluminum frame construction is rustproof. Stacks flat for easy storage. Mocha finish.